At almost the eleventh hour in working on Volume 1 of The Letters of Sylvia Plath (above) I received PDF's of the letters Plath wrote to Melvin Woody. There was a mad scramble to get the letters transcribed, proofed, annotated, and integrated into the volume before we reached the point of no returns (a.k.a. Indexing). But, they made it. And in my correspondence with Mr. Woody, he let it be known that he planned to give his original letters to Smith College. I got him in touch with Karen Kukil, and later in the year, Karen visited Mr. Woody in New Haven to officially acquire the originals for the collection at Smith College. 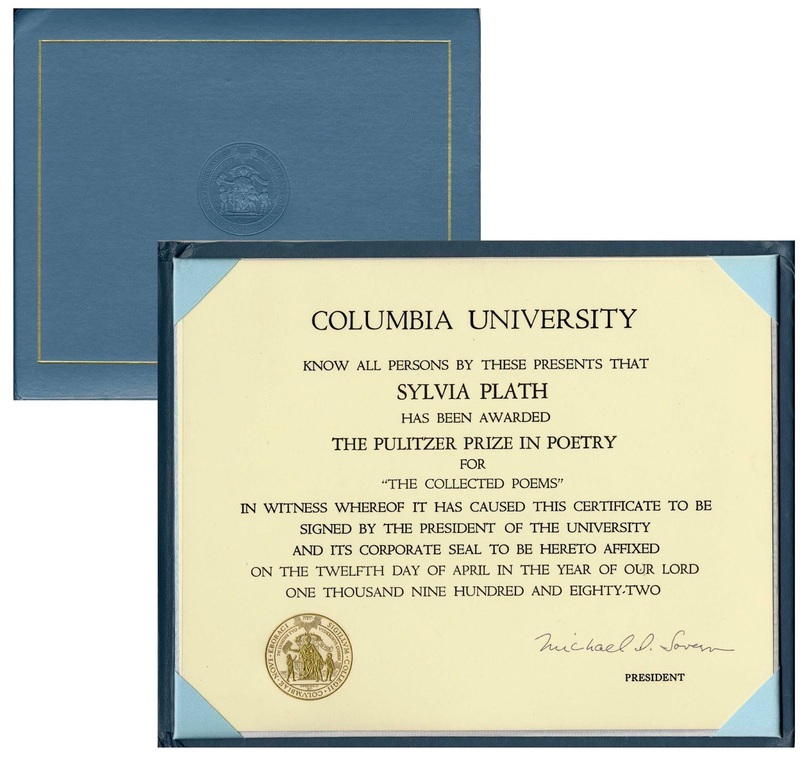 They join other caches of letters Plath wrote to friends she made during her Smith College years (Ann Davidow-Goodman, Marcia Brown Stern, Elinor Friedman Klein, and Philip McCurdy). 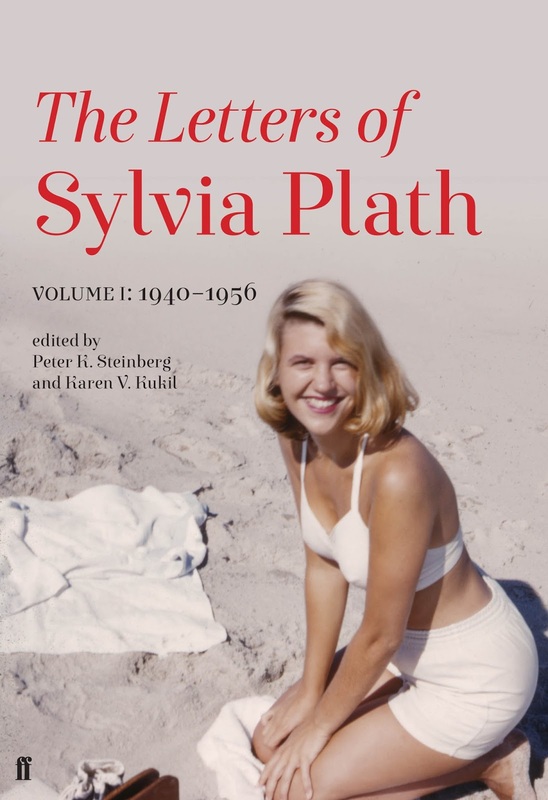 This blog post is simply done to announce that the letters are now formally a part of the Sylvia Plath Collection at Smith and open to researchers. They are physically stored in box 16.1, folder 19.1. 22 June 1951, written from Swampscott, Mass. 24 March 1954, written either from Smith College or Wellesley, Mass. 5 May 1954, written from Smith College, Northampton, Mass. 7 May 1954, written from Smith College, Northampton, Mass. circa 20 May 1954, written from Smith College, Northampton, Mass. 5 July 1954, written from Wellesley, Mass. 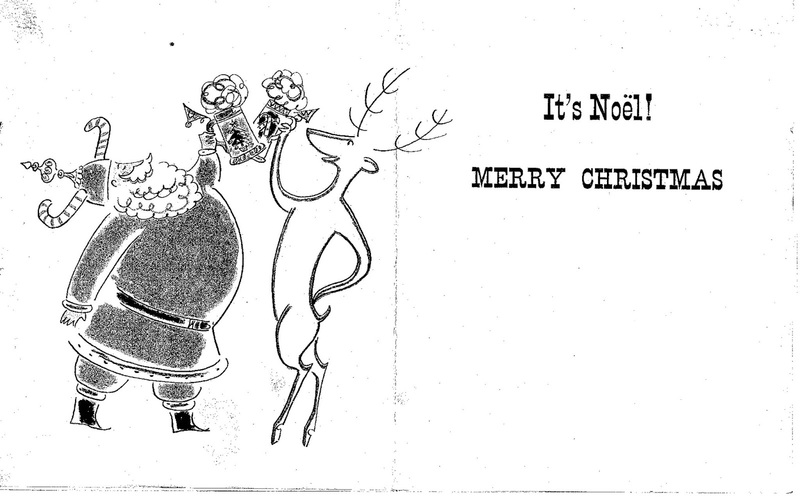 17 December 1954, written either from Smith College or Wellesley, Mass. 26 January 1955, written from Smith College, Northampton, Mass. The June 1951 letter was something of a revelation to me as if I had known that he was in the Plath picture at that time I had forgotten it. In my emails with Mr. Woody he let me know that he hitchhiked up to Massachusetts that summer and that he was the inspiration for "Cal" in The Bell Jar; that that scene was inspired by that visit he made to Plath and Marcia Brown Stern in Swampscott. Mr. Woody and Plath appear to have met for the first time slightly earlier than that summer during Plath's spring break from Smith College when Plath went with Marcia to her home in New Jersey (also visiting New York City). He appears on her calendar on 31 March 1951 as part of a double-date: Mel and Marty, Ted and Me. Not sure who Ted is. It's obviously not that Ted. 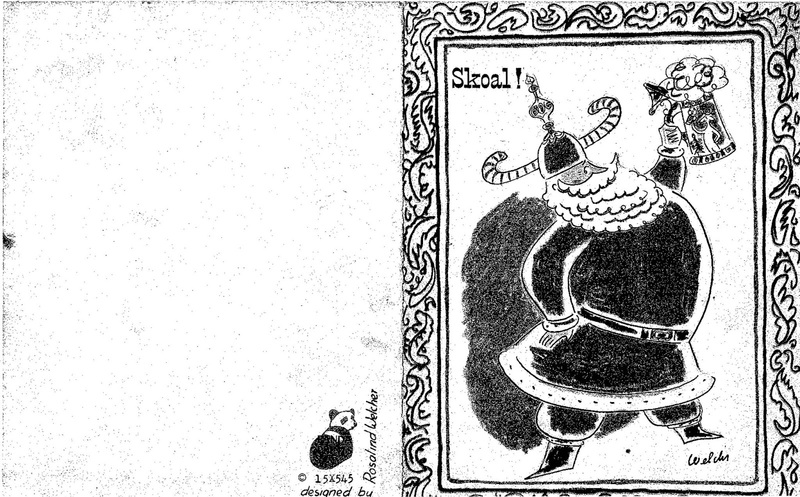 Naturally the letters are published, but the originals provide information missing from their printed siblings. At least I think seeing Plath's original handwriting and typewriting offers information, or rather, intimacy, that is unfortunately lacking in a printed book. 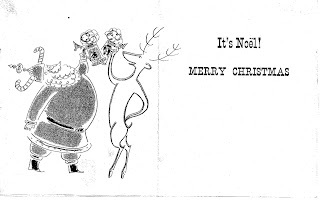 The December 1954 letter, for example, is in a Christmas card designed by Rosalind Welcher, an artist whom Plath certainly appears to have liked as a number of letters were sent in Welcher's cards. Here is a copy of the card (edited to obscure Plath's handwriting). I am very grateful that Mr. Woody answered my email query about the letters and believe that they add quite significantly both to The Letters of Sylvia Plath and the Sylvia Plath collection at Smith. 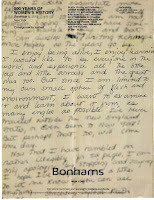 Lot 339 at the recent-ish Bonhams sale of the Property of Frieda Hughes was a lot that I was interested in and bid on. Unsuccessfully. When I found out that Christian White of Modern First Editions was the winner I looked forward to seeing what entire lot of 21 items included. 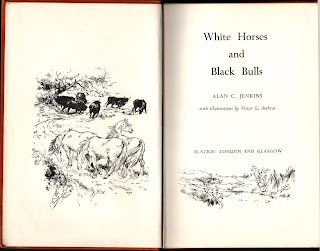 "JENKINS (ALAN C.) White Horse and Black Bulls, AUTHOR'S PRESENTATION COPY TO SYLVIA PLATH, inscribed "For Sylvia with every good wish and in the hope that you will stay in Devonshire. 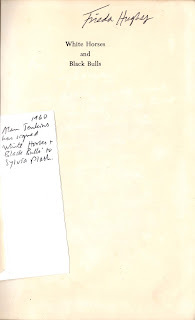 Alan" on the half-title, with later ownership inscription of Frieda Hughes, 1960." Jenkins was the step father of Plath's autumn 1962 live-in nurse Susan O'Neill-Roe Booth and who herself was the dedicatee of the poem "Cut". Susan's mother was Nancy Jenkins, who was secretary of the local bee keepers. They lived at a house called "Pear Trees" in Belstone, a village close to Corscombe, where Plath went horseback riding on a horse called Ariel. On one such meeting-up, before she moved to London, Plath and Jenkins took a walk and had plans in place for more when she returned to Court Green in the spring. Anyway, Plath visited the Jenkins' at their "Pear Trees" house on 17 November 1962 which was a busy day as she had a riding lesson that morning, welcomed Clarissa Roche that evening, and her poem "Berck-Plage" was aired on the BBC that evening. And according to her Letts Royal Office Diary tablet held by Smith College, she hosted Nancy and Alan on Saturday 24 November 1962 at Court Green, serving chicken and macaroni. A rather touching and heartbreaking story is related in an unpublished biography/memoir by Clarissa Roche...In London on Sunday, 10 February 1963, and delayed to the point of having to stay the night in London, Alan Jenkins set off walking toward Fitzroy Road. However, he had second thoughts and decided not to just turn up, unexpectedly, at 23 Fitzroy Road. He was afraid of disturbing Plath writing or entertaining. Roche writes that Jenkins thought Plath would soon enough be back in Devon and they would go, as planned, on country hikes. In fact, this prospect led Jenkins to purchase a new pair of hiking shoes. When it was learned that Plath died, those shoes he bought remained unused and were stored in the house next to the white smock Nancy Jenkins lent to Plath at the first bee meeting (see "The Bee Meeting"). Jenkins died in 1996, out on a walk wearing his old, well-worn shoes. 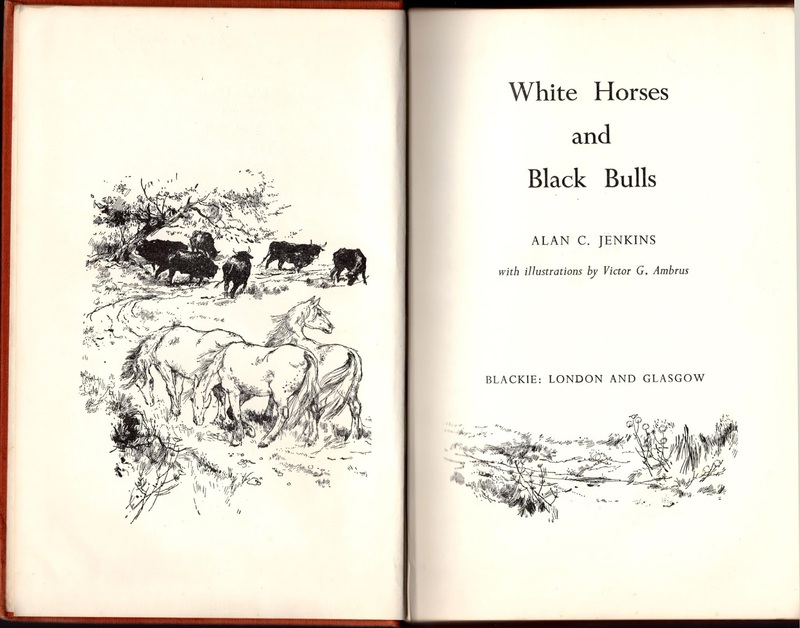 Alan C Jenkins, White Horses and Black Bulls, 1960, Blackie. 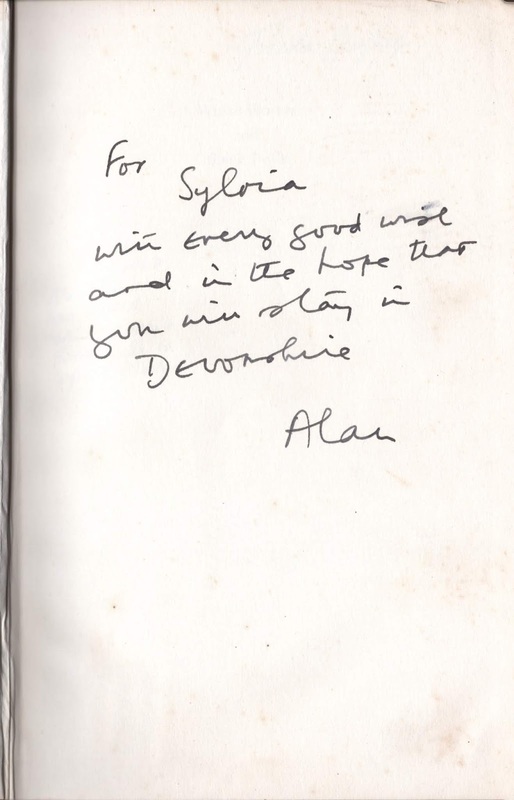 Inscribed by the Devon author to Sylvia Plath: "For Sylvia with every good wish and in the hope that you will stay in Devonshire. Alan." Jenkins was a writer and editor who lived for many years at Belstone about 3 miles from Plath and Hughes' home in North Tawton. 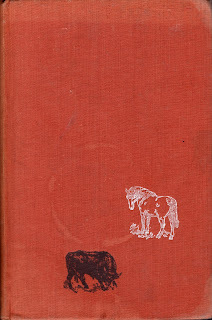 The book is in good condition only, having been read and re-read during its time in the ownership of Plath and Ted Hughes and subsequently Frieda Hughes – clearly a family favourite. 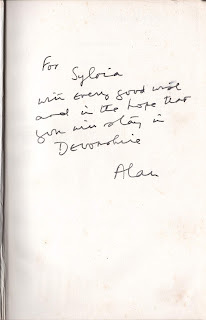 Jenkins' encouraging inscription from Jenkins to the newly arrived Sylvia Plath speaks very movingly of her brief residence in Devon that concluded with her separation from Ted Hughes and ultimately fatal return to London. Books inscribed to Plath are exceedingly rare and given this fact it is rather meaningful to own this one. 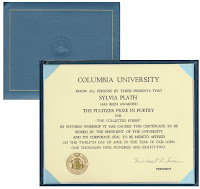 Naturally those books personally inscribed to Plath by Ted Hughes take the cake for their significance. However this was oozes sincerity in an entirely different way than Hughes' books to Plath, or even the copy of Marianne Moore's Collected Poems (held by Smith) signed and inscribed by Moore at the Glascock Poetry competition in April 1955. It is simply unknown if Plath read this book but it is clear that it has been read and cherished. I want to believe Plath did read it and she likely could have done so in an hour or two. I like to believe, as well, that the ring-stain on the cloth is from Plath's tea mug, but this is probably fantasy. Frieda's subsequent ownership inscription adds a touching piece of history to the volume. Her own well-documented interest in animals may have been inspired, in part, from reading this book in the 1960s or early 1970s. Possibly Nicholas Hughes read this volume, or had it read to him, as well. I imagine Jenkins handing this book to Plath at their last meeting before she departed North Tawton for London; given out of kindness and sincere hope that Plath would return in the spring. All links accessed 15 May 2018. 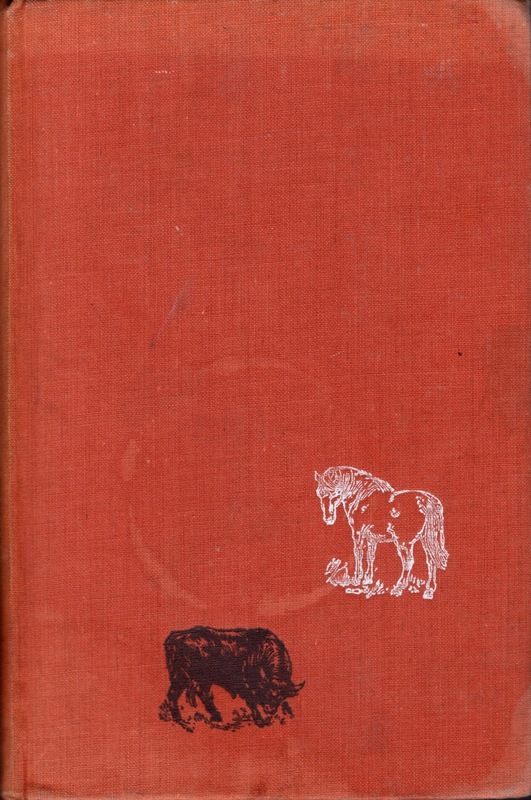 Dominic Winter, an auction house in England, recently featured a few Sylvia Plath and Ted Hughes lots in their 21 June 2018 sale. In each instance the lot sold for more than the high estimate. Lot 838 was a lot of five Ted Hughes books and one Plath limited edition (Child). This sold for £220. Lot 866 was a very lovely first edition copy of Ariel (Faber) which sold for £500. Lot 867 was an uncorrected proof of The Colossus (Heinemann) which from the image appears to have been a stunning copy. This sold for £1,950. Lot 868 saw a nice looking first edition copy with a closed tear on the front of the dust jacket of Ariel (Faber) sell for £420. On the previous day, 20 June 2018, Dominic Winter sold a 1967 copy of Plath's The Colossus as part of a general lot which also featured J. D Salinger. Lot 535 sold for £130. 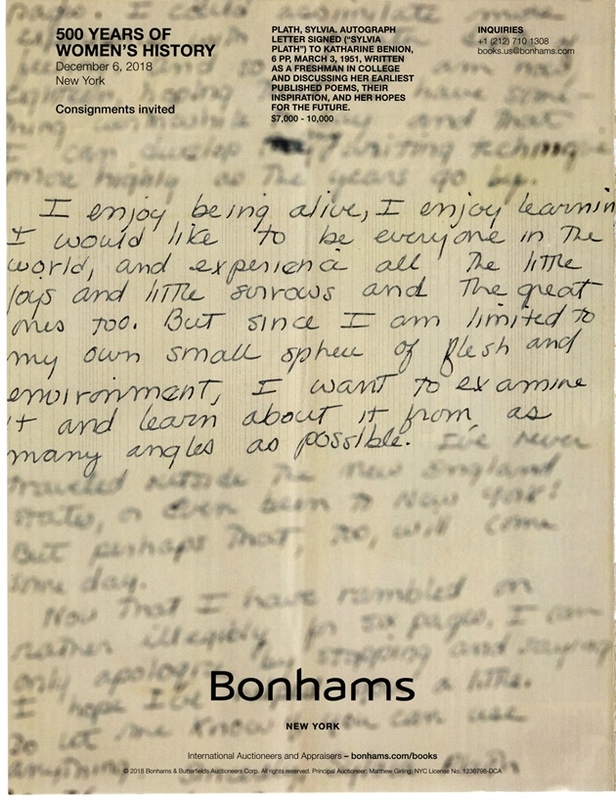 It might be hard to think that any auction could ever possibly top the Bonhams event early this year selling the Property of Frieda Hughes. More than likely, we'll see smaller sales. 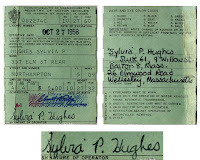 For example, recently Nate D. Sanders flipped two lots: Plath's Pulitzer Prize and her Massachusetts driver's license (part of the lot that featured six additional IDs and a wallet). Both items failed to sell with zero bid, which indicates not a lack of interest, I suspect, but that the bidding prices were unreasonable. 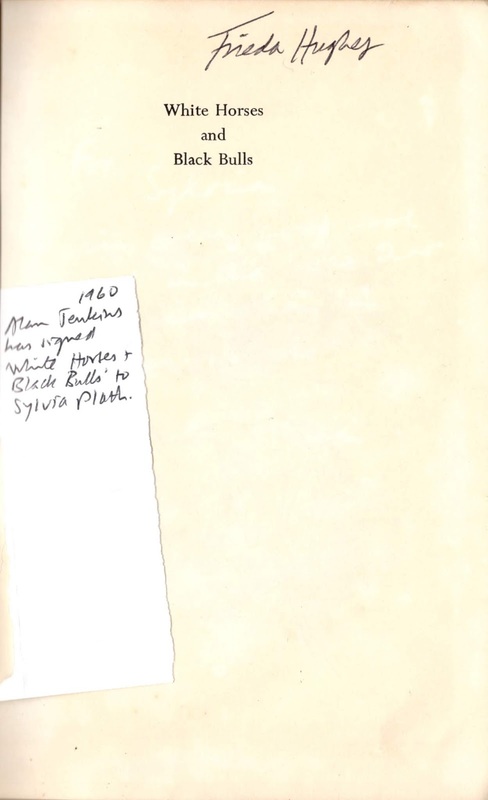 In the current summer issue of Fine Books & Collections, when you turn over the front cover you are confronted with Sylvia Plath's unmistakable handwriting. I know when I turned the cover I was completely arrested by it. The sample comes from a newly made-known letter. 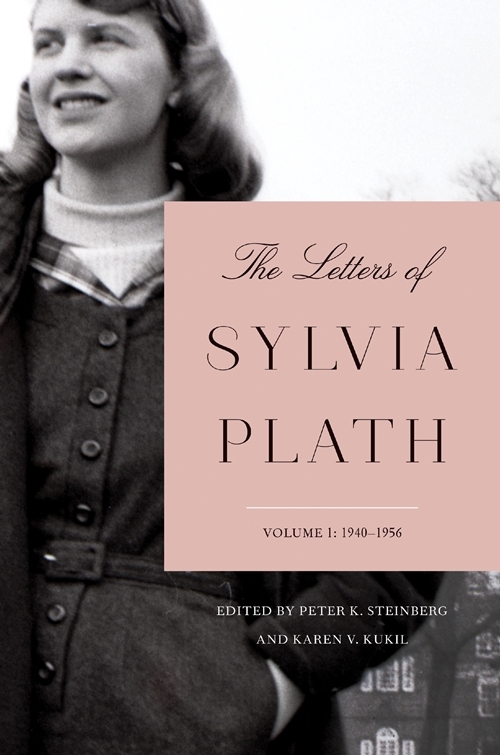 The six-page letter from Sylvia Plath to Katharine Benion was written on 3 March 1951. It will appear at auction in Bonhams New York on 6 December 2018. Estimates are $7,000 to $10,000. More information will be available later on in the year and I am already anxious about that. I suspected the letter existed as there is the incoming letter from Katharine Benion to Sylvia Plath held in Plath mss II at the the Lilly Library. Getting confirmation of the document is reassuring, but also frustrating as I am confident this would have been a fantastic letter to have in the book. It is my hope we can have a copy of it for later editions of the book. Also in the summer issue of Fine Books & Collections is a wonderful article by Ian McKay on page 21 which is a page-long summary of the big Frieda Hughes. Bonhams sale in March. The article focuses on The Bell Jar but does make reference to several other lots. As of today I have tracked 56 lots though the ones that contained multiple items which were purchased by booksellers are now being dispersed far and wide. All links accessed 23 June 2018.